This is the ultimate trek for the traveler who's done it all and is still seeking a truly rewarding experience. We cross 9 demanding high passes, the highest is 18,275 feet! Our journey begins in the lowlands of Lower Dolpo following lush valleys and steep river canyons typical to the south side of the Himalayas. When we cross the first pass, we enter the distinctive heights of the Tibetan Plateau, upper Dolpo. Over 24 days of trekking we bounce back and forth between these two worlds. To make this journey even cooler, we extend the trek by departing the regular route and traversing to Mustang on the soon to be famous Great Himalaya Trail. This is an impressive traverse across remote and rarely visited regions. We see very few trekkers, especially when we leave Dolpo and traverse the high passes to the Kingdom of Mustang. This is "old" Nepal and when we say "off the beaten path," we really mean it on this one. No backtracking! We bring "regulars" from the IMG Sherpa Team. These guys are the best in the biz and it's worth bringing them half-way across Nepal to make this trek the best it can be. Trek the valley of the Kali Gandaki between two 8000m peaks, Dhaulagiri and Annapurna. For those with an interest in Tibetan culture, Dolpo is as Tibetan as it gets. 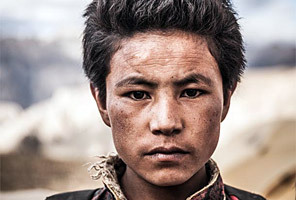 Isolated and governed by Nepal, Dolpo is "more Tibetan than Tibet" in 2015. In 2013 we saw snow leopard tracks. Dolpo's isolation makes it home to the largest snow leopard population on Earth. For you literary buffs, this is the region that Peter Matthiessen and George Schaller explored in the classic book "The Snow Leopard." I led the first IMG Dolpo Trek in 2013, and it was the most incredible trek I've ever done. Dolpo is super-remote and more committing and strenuous than some of the other treks out there. BUT, if you can put one foot in front of the other, the acclimatization schedule is perfect. We travel self-sufficiently like we did before lodges and teahouses inundated popular trekking regions of Nepal; staying in our own tents and eating from our own kitchen complete with cooks. We'll pick up chickens or a goat every now and then as we eat down our supplies! Once we hit the trail there is no easy way out, so show up healthy and in great shape. I have no doubt that you will find this trek very rewarding. Check out my 2013 Dolpo trip report to see pictures and get a feel for the trek.